Do Walnut Tree Roots Grow Down or Out? Across its native Eastern United States, the black walnut tree (Juglans nigra) becomes a large, picturesque shade tree, but it's rarely planted in residential yards. Typically, walnut trees are enjoyed in large pastures or woodland clearings or preserved on parkland estates. The nuts are edible, but its roots secrete the chemical juglone, limiting the growth of many nearby plants. The root system grows both downward and outward during its lifetime. After a walnut seed sprouts, the initial growth of the seedling is fast. In a fertile, moist soil, a taproot penetrates downward as far as 24 to 30 inches, while in sandier, slightly drier soils, the taproot reaches as deep as 4 feet. In the second year, the taproot continues to grow, but branches or lateral roots begin emanating off the main taproot. More lateral, fibrous roots tend to form in lighter textured sandy soils. As the young walnut tree grows over the first 10 years of its life, the roots continue to grow more laterally than like downward-spiking taproots. If other competing trees, shrubs or grasses grow in the vicinity and deplete the shallower soil depths of moisture, walnut tree roots tend to grow more downward to secure position in moister, deeper profiles. In regions that received plenty of summer rainfall during the walnut tree's growing period, the tree roots also remain more horizontally oriented than downward angled in development. A 9-year-old walnut displayed a 7 1/2-foot-long taproot with lateral roots extending 8 feet from the taproot, according to the U.S. Forest Service. 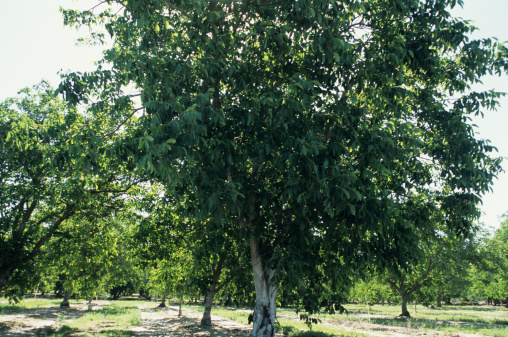 On mature walnut trees that approach 60 feet tall with canopies 70 feet wide, the root system combines the characteristics of both taproot with numerous horizontal surface roots. The depth of roots depends on the soil and moisture regimen that particular tree experienced across its lifetime. Drier conditions promote deeper roots with downward angles, while moister soils encourage less taproot and more lateral, surface-dwelling roots. As with all trees, the roots of a walnut tree extend outward two to four times the tree's canopy diameter. The mature walnut tree's root system is a combination of a taproot from its youth, downward-angled roots and horizontal roots near the soil surface. Roots do not all penetrate deeply into the soil, as that isn't where warmth, rainfall and organic nutrients lie. Expect the vast majority of the tree roots to be no deeper than 3 to 7 feet in the soil. Within the top 6 to 24 inches should be the most feeder and horizontal roots that take advantage of decaying organic matter, warmth and rain moisture. Are the Roots of a Cedar Tree Deep?